On the 18th (Thu), tour the pleasant surroundings at Angel's Landing. For where to stay, reviews, other places to visit, and tourist information, you can read our Zion National Park online tour itinerary planner . Newark to Zion National Park is an approximately 9-hour combination of flight and car. You can also do a combination of train, flight, and car; or drive. The time zone difference moving from Eastern Standard Time to Mountain Standard Time is minus 2 hours. While traveling from Newark, expect somewhat warmer days and a bit cooler nights in Zion National Park, ranging from highs of 69°F to lows of 35°F. Finish your sightseeing early on the 19th (Fri) to allow enough time to travel to Tucson. On the 20th (Sat), see the interesting displays at Arizona-Sonora Desert Museum and then take in breathtaking views at Sabino Canyon. To find ratings, photos, traveler tips, and tourist information, refer to the Tucson trip app . You can do a combination of taxi, flight, and shuttle from Zion National Park to Tucson in 5.5 hours. Other options are to do a combination of taxi and flight; or drive. Expect a bit warmer temperatures when traveling from Zion National Park in April; daily highs in Tucson reach 82°F and lows reach 53°F. Cap off your sightseeing on the 20th (Sat) early enough to go by car to Sedona. Start off your visit on the 21st (Sun): stop by Cocopah, then trek along Broken Arrow Trail, and then explore the striking landscape at Cathedral Rock. 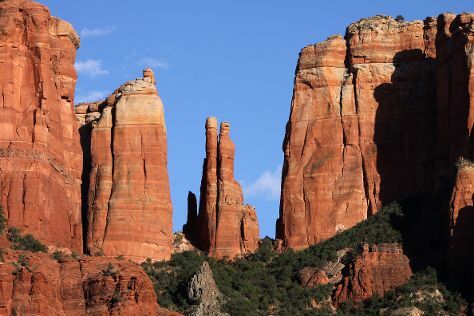 Get ready for a full day of sightseeing on the next day: take in breathtaking views at Oak Creek Canyon, cruise along Red Rock Scenic Byway (SR 179), and then take in the dramatic natural features at Bell Rock. To find ratings, where to stay, traveler tips, and tourist information, refer to the Sedona trip itinerary maker app . Getting from Tucson to Sedona by car takes about 4 hours. Other options: do a combination of shuttle, flight, and taxi; or take a bus. Expect slightly colder temperatures when traveling from Tucson in April; daily highs in Sedona reach 72°F and lows reach 48°F. Finish your sightseeing early on the 22nd (Mon) to allow enough time to travel to Moab. Start off your visit on the 23rd (Tue): take your sightseeing to a higher altitude at Arches National Park. On the 24th (Wed), you'll have a packed day of sightseeing: get the adrenaline pumping with an extreme tour. To see photos, ratings, other places to visit, and more tourist information, read our Moab tour itinerary planner . You can do a combination of taxi, flight, and car from Sedona to Moab in 6.5 hours. Alternatively, you can do a combination of shuttle, flight, and car; or drive. Traveling from Sedona in April, expect Moab to be slightly colder, temps between 67°F and 38°F. Finish up your sightseeing early on the 24th (Wed) so you can go by car to Arches National Park. Start off your visit on the 25th (Thu): take in the dramatic natural features at Fiery Furnace, then explore the striking landscape at Delicate Arch, and then take in the dramatic natural features at Double Arch. To find other places to visit, photos, reviews, and more tourist information, read Arches National Park road trip website . Traveling by car from Moab to Arches National Park takes an hour. 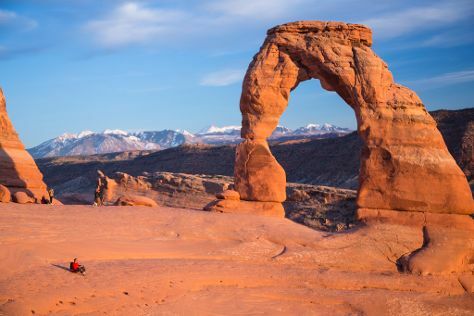 In April, daytime highs in Arches National Park are 67°F, while nighttime lows are 38°F. Wrap up your sightseeing by early afternoon on the 26th (Fri) to allow enough time to travel back home.